Guattari’s background was unlike that of any of his peers. In 1953, with psychoanalyst Jean Oury, he founded the La Borde psychiatric clinic, which was based on the principle that one cannot treat psychotics without modifying the entire institutional context. 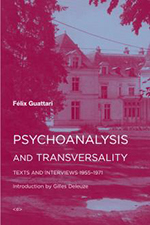 For Guattari, the purpose of “institutional psychotherapy” was not just to cure psychotic patients, but also to learn with them a different relation to the world. A dissident in the French Communist Party and active in far-left politics (he participated in the May 1968 student rebellion), Guattari realized early on that it was possible to introduce analysis into political groups. Considered as open machines (subject-groups) rather than self-contained structures (subjugated groups), these subject-groups shunned hierarchy and vertical structures, developing transversally, rhizomatizing through other groups.